The Oklahoma men's basketball team was picked sixth in this year's official Big 12 Preseason Poll, the conference office announced Thursday. The order of finish was voted on by the league's head coaches (they were not allowed to vote on their own team). Kansas finished atop the poll with 81 points (nine points were awarded per first-place vote, eight points per second-place vote, etc.) and was unanimously picked to win the league. KU was followed by West Virginia (65 points), Texas (59), Iowa State (56 points), Baylor (53 points), OU (40 points), Oklahoma State and Texas Tech (32 points each), Kansas State (20 points) and TCU (12 points). 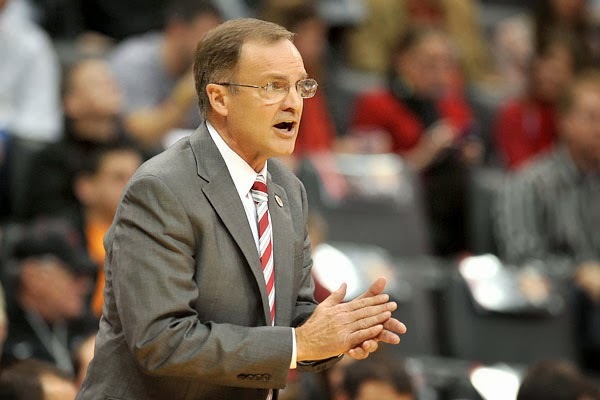 OU has finished higher than where they were picked in the Big 12 Preseason Poll in four of the five seasons under head coach Lon Kruger. Oklahoma has finished the regular season in the top four of the Big 12 standings in each of the past four seasons. The Big 12 is coming off its third straight campaign of sending a nation-leading seven teams to the NCAA Tournament. Last season, five of those seven teams were seeded fifth or better in the tournament, the most of any conference. The Big 12 has also been the top conference in the nation in the RPI for three consecutive seasons and boasted the nation’s best non-conference winning percentage in 2015-16. The Sooners return two starters from last season’s Final Four squad in forwardKhadeem Lattin and guard Jordan Woodard. Last week, Woodard was named a Preseason All-Big 12 Team honorable mention selection. Oklahoma opens the 2016-17 season with a home exhibition game against Washburn on Nov. 8. The Sooners begin the regular season on Nov. 13 when they host Northwestern State. Season tickets are available by calling (800) 456-4668 or by clicking here.